We all love extreme sports right? Well in honour of all of these great sports, we take a look at some of the very best extreme sports stars in the world. From the guys who refuse to accept limitations to those who risk life and limb in their pursuit of greatness, we present to you, the top five extreme sports stars the world over! Very ramp skateboarder Danny Way makes the list simply for the sheer scale of his achievements. We’re not talking about him walking away with gold in 2004 X-Games, but the actual scale of what he does! Danny Way holds the world record for distance and unaided height when it comes to skateboarding, and he was also the first person to leap the Great Wall of China unaided! How could we leave him off the list?! Sarah gets our vote for a number of reasons, not least thanks to her unparalleled efforts in lobbying the X-Games to include female events in the Freeski arena. It also helps that she has managed to throw down 720’s, 900’s and 1080’s in the half pipe before any other female performer in her field. A great athlete and a great person in the history of the X-Games. We will never forget her. Dave Mirra has to have a mention in this list. He is without doubt one of the most famous extreme sports stars in the world, and his name will live on well beyond his time in the sport. His dedication to BMX has meant 23 medals, which is a record, and an incredible haul of 14 individual gold medals, which is also the most anyone has collected thus far. On top of these achievements, he has also been honoured by the likes of BMX magazine as Freestyler of the year, as well as collecting the ESPN Action Sports and Music Award for BMX Rider of the year in 2000. Dave Mirra is simply the best BMX’er of all time. 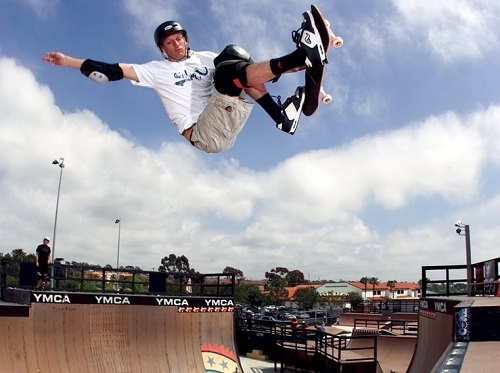 What list would be complete without the name of living legend Tony Hawk? Hawk is everything anyone needs to know about skateboarding, and has single handedly turned the sport into one that is followed the globe over. The acceleration of skateboarding since his participation has been immense, and we all know by now that his fame revolvers around his technical ability as much as his ability to manipulate the business side of the sport. Famed for being the first person ever to pull off a 900 on the very ramp, there’s no doubt that Tony Hawk is one of the greatest skateboarders of all time. This entry was posted in BMX, Land Sports, Motocross, Mountain Biking, Skateboarding, Skiing, Snowboarding, Winter Sports and tagged Danny Way, Dave Mirra, Sarah Burke, Shaun Palmer, Tony Hawk. Bookmark the permalink.